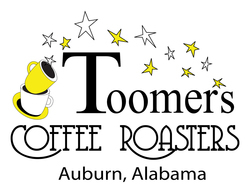 We partner with Toomer's Coffee Roasters in Auburn, Alabama to bring you a great cup of coffee to enjoy with the baked goods we serve. Not only is Toomer's Coffee roasted in Alabama, they use an Infrared Roasting Technique resulting in a low (ph) acid coffee. The decaf coffee is a Swiss Water Process Brazil Decaf which uses water only and no chemical solvents to extract the caffeine. ​In addition to a wonderful cup of "black" coffee, we have a syrup bar and real cream to customize your cup of coffee if desired.